The power of the Customer Thermometer service has always been to solicit responses from recipients from within emails – simple icons and a single simple question mean it’s hard to ignore. A response often leads to a comment too. If you make it simple to start a dialogue with a customer – inevitably they will be happy to engage and potentially give more. If you ask them to click a link to a 20 question survey which will only take 10 minutes, typically, they will never engage in the first place. 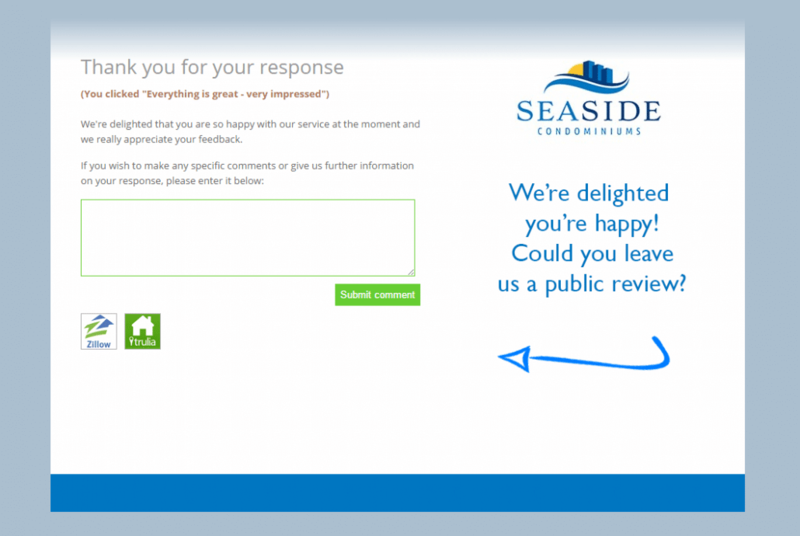 An initial response or rating is great – it gives your business valuable feedback that you can and should respond to. Sometimes though, you need more. You might want to ask a second survey question. Click the link to find out how. You might want to ask for more information via a comment. You might only want to do that for disappointed customers… you may not have the resource to respond to all comments and so want to limit it to hearing more around negative feedback. Alternatively, you might only want to ask for comments to people leaving a Gold response – “Tell me more about why your agent did so well today – we’d like to reward her”… That’s entirely possible – you can now enable comments for individual ratings pages. So, how do you increase your customer reviews? Get that initial click! Whilst we believe in the power of private feedback (ensuring problems get dealt with before they become issues), we also know how important online reviews are too. Encouraging a delighted customer to tell the world about their experience with you is a tricky thing to do – you don’t want to make it an onerous task. With the release of v2.08 – using Customer Thermometer as a “gateway survey” means that asking a customer to leave an online review or feedback via a social network is now a breeze. 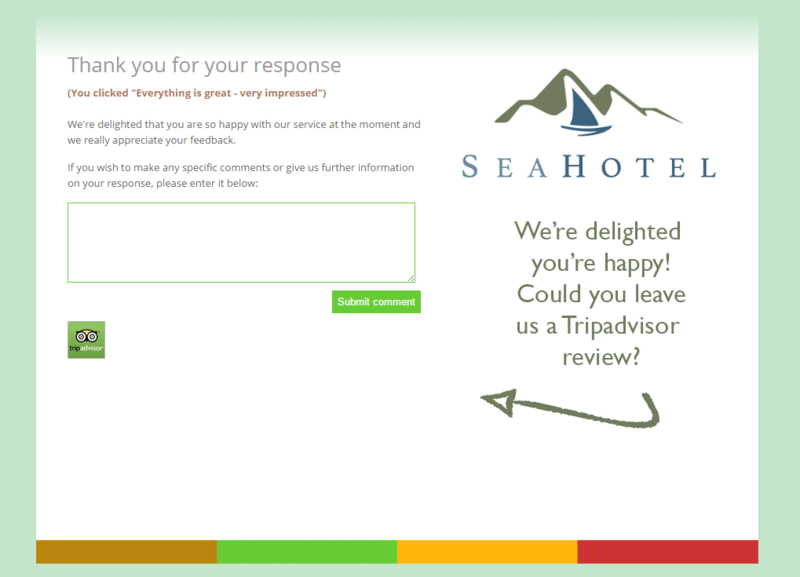 There are two areas on the Landing pages which you can now use to persuade someone to leave a online review. 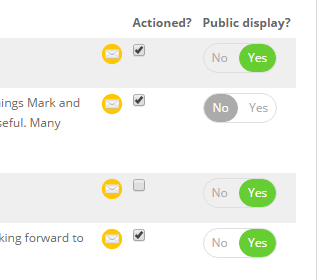 The advert area and social media icons can now be enabled per ratings page. As an example, this means Realtors® could ask customers who respond with a Gold or Green to their initial survey to leave an online review on Zillow or Trulia. You can include the icons with direct links… AND create an advert image which encourages recipients to do that… potentially even offering an incentive if they did… something to test out at least. Of course – if you had a red response… you would more likely remove the social icons and advert and encourage a comment to be left to find out more. Whatever the feedback that is left – it’s going to be insightful and either help internally to improve, OR improve your online reputation. Likewise, a red response landing page should have comments encouraged and enabled and all social media removed… As ever, a follow up is essential too! There are so many ways to use Customer Thermometer – we hope you consider using it to drive customer reviews – because, you are what you are online. If you’d like to test out Customer Thermometer as a gateway survey tool – you can sign up for a free trial in seconds below. This has huge power. By reaching customers with the option to rate a product or service before they get on social media, it puts some of the control back in the hands of the business. This way they can uncover and fix problems as they arise.